As I’ve said before, one of the biggest surprises for me during MYWTM is the amount of roving entertainment all around the park. Walt was a huge music lover and I knew about the Disneyland Band and the barbershop quartet known as the Dapper Dans, and some people in Victorian costumes who sing at Christmas, but other than that I had no idea about the little groups and bands that are all over Disneyland. I’m so glad MYWTM is making me slow down and enjoy the atmosphere because I really would have missed these fabulous gems just like I have every year before MYWTM. It’s the Jambalaya Jazz Band! Nope, it’s not the Dixieland Band, although they are often confused with each other. They even had Mardi Gras beads in their pockets that they tossed to a few of the little kids standing around. And said children didn’t even have to…*ahem*…do anything to get some beads ;). 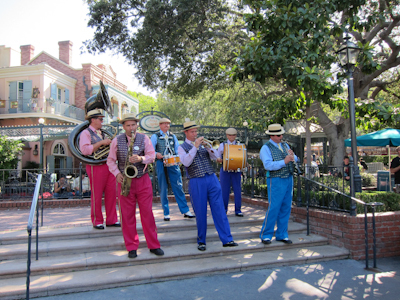 The Pearly Band, a jolly performance in front of the castle with special guest stars Mary Poppins and Bert! The Dapper Dans, which everyone seems to know about. No special guests that I saw but their singing is second to none, and their chime-playing (Kelli knows the proper term for that) is really fantastic. The Hook and Ladder Company, a bonny group of firemen and their mascot Spot, who is nearly kidnapped by the evil Cruella DeVille, and we’re also entertained by Chip and Dale and Goofy. Arrrrr, the grimy band of pirates, the Bootstrappers, singing traditional pirate tunes (sans ale) in New Orleans Square. What's a pirate's favorite letter? Arrrrrrrrrrrrrr. 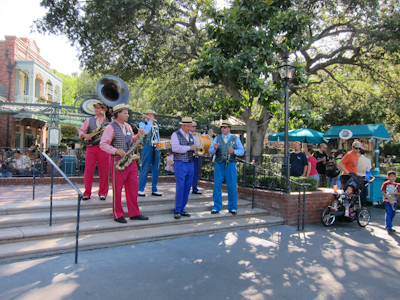 And of course, the Disneyland Band. Now that’s entertainment! And all of that entertainment–the kind you can basically trip over on your way to somewhere else–I think that’s a part of the Disneyland Magic, don’t you? Oh, that’s so adorable! What a fun, sweet thing to do. And as a bystander I would have LOVED to see a little kid with her toy sax playing with the bad. So fun. My favorite Dapper Dans bit is when they play the Degan Organ chimes. Each performer holds a set of chimes in each hand, for a total of eight notes (or a full octave) of 110 year old coordinated musical enjoyment.